This year marked the beginning of my war against ALS as part of the Team Blazeman effort. I have competed in three triathlons and one half-marathon so far this season that will culminate in a 10 hour triathlon on Sept. 12th. The season has been one of determination (lack of sleep and poor nutrition as part of living as a father of two) and dedication (5am mornings 5-6 days a week). Through it all, I have felt a sense of someone pushing me along. Each run, each race, each workout…I have this sensation that I’m not alone. Some of this is my continued growth in my faith but equally important is knowing that I am in the frontline of a battle with other Warriors. There are others out there, like me, that have lost loved ones to this terrible disease we call ALS. I see their encouragement online, face-to-face and through phone calls. I promise that as long as I am able, I will continue to fight along side these fellow Blazeman Warriors until a cure is found. 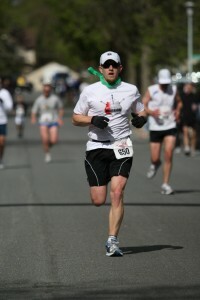 My first race of the Blazeman season was a half marathon in the small community of New Prague. This short 10 minute drive from my house was a great way to start the season. I really was unsure how I would do as I hadn’t done many longer training runs but I wanted to give the race a shot. It was idyllic conditions (outside of a decent wind) and I had one of the best races of my life…on my birthday nonetheless! Finishing the race in a time of 1:36 averaging 7:24/mile, was significantly faster than I was expecting. This course certainly isn’t flat and was encouraging that I may be able to drive for even faster times with the right preparation. Lake Waconia was my first major triathlon of the season (I competed in one indoor triathlon in April). The weather was miserable with 25 mph wind. The race director cut the swim in half. Unfortunately, swimming is my forte so I had to make up for it on the run and bike. The course ran along the side of the lake with the run culminating in a hill called ‘Graveyard Hill.’ While the race pushed me to my limits, I was able to finish strong and roll across my first triathlon finish line. It was a surreal moment with friends and family when I finished. Knowing that this was just the start of a battle to win this war on ALS. It was gratifying to compete and finish strong, yet daunting knowing the larger struggle of those I was representing. It was nonetheless the first step in a long journey. This was a wonderful event that we fit in while trying to find a good sprint to carry use between Waconia and St. Paul in August. Lots of interesting elements to this race (e.g. two transition zones, no bike racks, short 8 mile bike ride, etc.). I had a great race that day with a strong swim, decent bike ride and my fastest run ever (under 6:50/mile). This is one of the closer events to my house and one I will certainly consider doing again next year. Had numerous opportunities to share why I ‘roll’ and more information about ALS and the fire behind my triathlons. Instantly one of my favorite events of my short triathlon career. 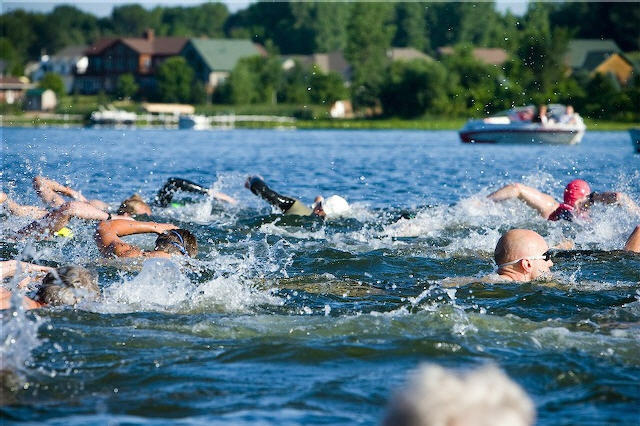 This race takes place in the calm Lake Phalen just north of downtown St. Paul. While the unique multiple lap swim made for an interesting merger of heats as the race went on, I had one of my strongest swims of the season (enjoying my first race in my new Orca Wetsuit). After a strong ride and a decent run, I rolled across the finish line in Blazeman style. Two quick highlights to this race. #1) I had the wonderful opportunity to meet my first fellow Blazeman Warrior in person. Ironman Tim Smit was gracious and supportive as we both compete for a higher cause. #2) It was a wonderful spectator event where my daughters, wife, sister-in-law and parents could easily catch me multiple times on the course. Certainly helped motivate me to my strong finish. I finally had the chance to read this. Wow–you are fast! Some killer run paces. Glad to have you as a fellow Blazeman Warrior! Are you seriously the red swim cap on the right?! Pretty impressive camera work.. was that me? LOVE YOU and am SO PROUD of you Joel. Joel,I finally had the chance to read this. Wow–you are fast! Some killer run paces. Glad to have you as a fellow Blazeman Warrior!